Assets include metal inventory and cash. At November 30, 2011, in addition to its metal inventory, which had an estimated fair market value of US$111.5 million, the Company had cash of approximately US$4.0 million for a total of US$115.5 million, or US$1.51 per share, based on 76.4 million shares outstanding, or, US$1.29 per share on a fully diluted basis of 96.8 million shares outstanding. The share price is currently at 0.4850 CAD (approximately 0.475 USD), making it possible to buy assets with a 63% discount (fully diluted). The company discloses the NAV weekly on it’s website, and with Google it’s easy to check that the listed prices for the various elements are reasonable (spot prices can be found here or here). Besides the huge discount there is even more good news. The company has been buying back shares, and at the end of November it reported that it has bought back 5.5M shares since June this year and that it has 1.2M shares remaining that it can buy back under the current Normal Course Issuer Bid. Given the big discount buying back shares seems to be an excellent allocation of capital, and the amount of shares they are buying back is actually the maximum that is legally possible in Canada (there is a 10% of public float/year limit). So far it looks like we can buy a company that is shareholder friendly at a high discount to NAV, but unfortunately it’s not that simple. Just like Urbana it’s probably best to view Dacha as a closed-end fund, and the two big questions that haven’t been answered so far is: are management incentives aligned, and what are the expenses? 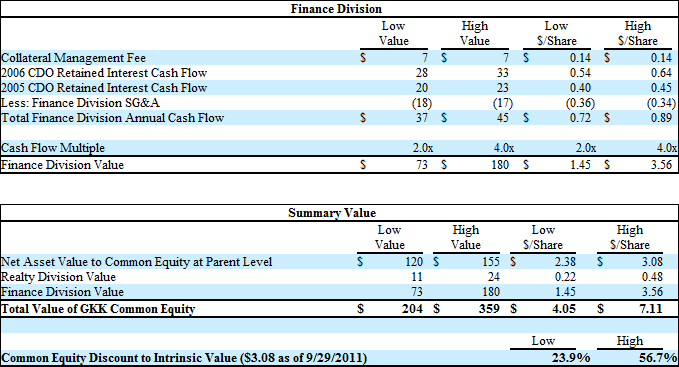 In fiscal year 2011 DSM had 5.2M in expenses while the net asset value increased from 27.2M to 52M (numbers in CAD, the company switched to reporting in USD this year). This would give us an average asset value of ~40M and with 5.2M in expenses we would get a TER of ~13% (HUGE!). The picture for this year looks better though. The company had 2.57M in expenses for the first six months, keeping expenses roughly constant while NAV increased from 53M to 128M, resulting in an expense ratio of roughly 5.7%. It’s partly an issue of scale, but most of the expenses are related to management pay, and I have a hard time imagining that they really add a whole lot of value trading rare earth elements. While executive compensation is in my opinion high (especially when you consider that Stan Bharti is chairman of more companies than I can count) there are two slightly positive things. The number of warrants granted is actually based on the estimated value of these warrants, so the bigger the company the smaller the dilution. Secondly the strike price of the warrants is very close to the current share price of DSM, so if they want to make money they do have to preserve shareholder value. The potential value of the warrants is also significant compared to the base salaries; so the incentive is there. Another positive sign is that there has been some insider buying this year in the open market. The CEO bought in September 100,000 shares for 0.628 CAD/share, not an insignificant amount compared to his base salary. But there is currently not a lot of insider ownership: as a group they own roughly 5.5M shares compared with a total of 76.4M shares outstanding. Another negative point are the various related party transactions on the balance sheet. Nothing excessively bad; but there is for example a 3M loan to a related party that seems to be bad (and management took a long time before recognizing the loss while the loan was actually already non-performing). The company also has a small investment in another related company, it loaned money from a related company in the past and it paid consulting fees to a related party. DSM doesn’t seem to be the best company, and the management also doesn’t seem to be the most shareholder friendly. There are plenty of things that I don’t like, but on the other hand: the discount is at the moment very big, and it’s not all bad. There is some insider buying and the warrants do align shareholder and management interests somewhat. They also offer a bit of a margin of safety, besides the current discount, because a dropping share price would be anti-dilutive. I have not yet made up my mind, but at the moment I’m inclined to make DSM.V a small position in my portfolio (let me know what you think!). But even if I would be more comfortable with the management I would keep the position small. Falling rare earth element prices are a significant risk and prices have been pretty volatile. A more enthusiastic long case at Old School Value. This entry was posted in Research and tagged DSM.V on December 28, 2011 by Alpha Vulture. The end of the year is always a good time to look back, and even though I started this blog a little bit more than a month ago there is actually something to talk about since two of the three companies in the blog portfolio have released new financial reports. Asta Funding reported its results for the fiscal year 2011, and financial performance was roughly as expected. The cash flow from the zero basis portfolio’s remains strong and predictable and the company had as of 14 December $108.8M in cash and securities versus a market cap of 122M right now. What they are doing with the cash is a more mixed story though. The results of the share buyback program have been very disappointing so far: they practically didn’t buy any shares back. On the conference call the CFO indicated that this was because of liquidity and legal constraints, but personally I find that hard to believe. If this doesn’t improve next quarter I’ll probably reduce my position a bit, since the share buy back for $20M was originally one of the attractive points of the stock. At the same time 13M of cash has been moved in securities, and 3.5M has been invested in the litigation funding business, something the company had never been active in previously. While it’s hard to know how this is going to work out I think it’s positive that the company is starting relatively small. The increase in raw material costs, double-digit increase in labour wages in Guangdong Province, the PRC and the continuing appreciation of Renminbi were amongst the adverse factors that contributed to the erosion in the gross profit margin. On top of this, the shortage in both electricity and labour supply had further increased the difficulties and challenges in our operations. Most of these factors would also impact competitors and should not permanently impact the viability of the underlying business. We should never expect great profit margins from a commodity business like this, but there is also no reason to be overly negative, and the company remains cheap with a very strong balance sheet. The discount between NAV and share price has increased a bit more the past month. The share price for URB-A.TO is currently 0.88 while NAV/share is 1.73. Even though it currently doesn’t look pretty in my portfolio it’s actually positive news. The company is steadily buying back shares, and the bigger the discount the better for remaining share holders. I bought the company less than a month ago and since then the share count has already been reduced from 75.5M to 74.4M (December 16 report date). This entry was posted in Portfolio and tagged 0684.HK, ASFI, URB-A.TO, URB.TO on December 23, 2011 by Alpha Vulture. The earnings that the company report are a bit too pessimistic. They are in the process of writing down goodwill, and the depreciation of property and equipment is also keeping the reported earnings down. At the moment they have almost completely written this down, while no significant capex is planned for the near future. That said: the company is still destroying value. 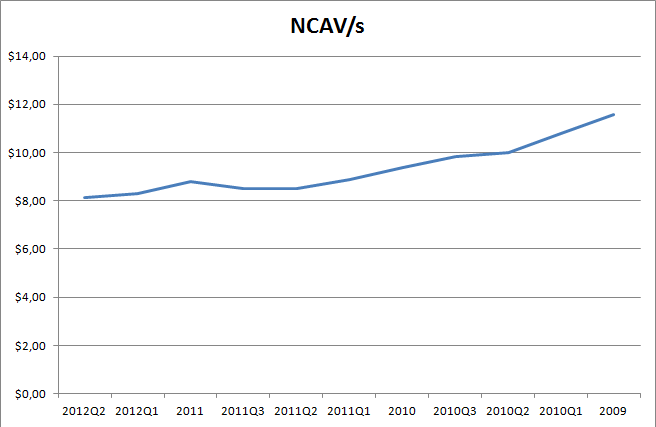 Since the company is not paying dividends or expanding we can simply look at the NCAV/share to get a good idea on the value creation or destruction at the company. So far they have been unable to turn the business around. The speed of the bleeding has slowed down, but it’s certainly not positive. And while they currently operate with property and equipment that has been written down to just 193K: there is going to be a point in the future were they need to start spending money on capex. Another development that is potentially worrying is that the allowance for doubtful accounts as a percentage of total accounts receivable has dropped significantly. They had an allowance of 408K on total accounts receivable of 3192K previous year while it’s currently 64K for 4077K accounts receivable. There might be a good explanation, but it could also be that the quality of the accounts receivable asset is deteriorating. If management manages to turn the business around or quickly liquidates the company there is probably a lot of value in MEAD. It might happen, and yes they are in the meantime not destroying value at an alarming pace, but at the same time it’s mostly wishful thinking. There is not a cash flow positive business hiding behind the numbers, or a historical profitable business that’s just having a bad year. At the same time; there should probably be a number were buying MEAD makes sense. What do you think? This entry was posted in Research and tagged MEAD on December 14, 2011 by Alpha Vulture.